Using an analog display to show your PC's various statistics seems to be a fairly popular modification right now. One such example of using an analog display was carried out by programmer and hobbyist electrician Cristiano Cesaretto. 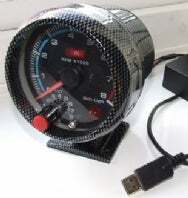 He grabbed a cheap old tachometer, usually used to display a car's engine revs, from eBay and then modded it to display his PC's CPU usage via a USB cable. Christiano details how he achieved this mod on his blog, and you can find more general instructions over at DIY Life.